You know how I love the justaposition of old and new, right? Well The Crescent is a group of luxury new build flats Edinburgh residents who are into contemporary architecture will love. Thanks to Cala Homes Edinburgh has fabulous new architecture siituated in the heart of its UNESCO world heritage status listed historic center. 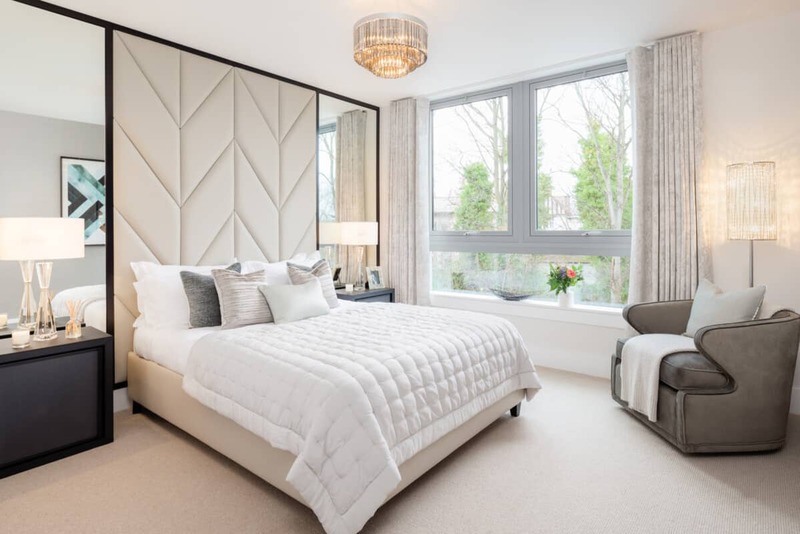 The Crescent homes are very contemporary and yet fit seamlessly into its surrounding of neoclassical Georgian architecture from the mid-18th century. 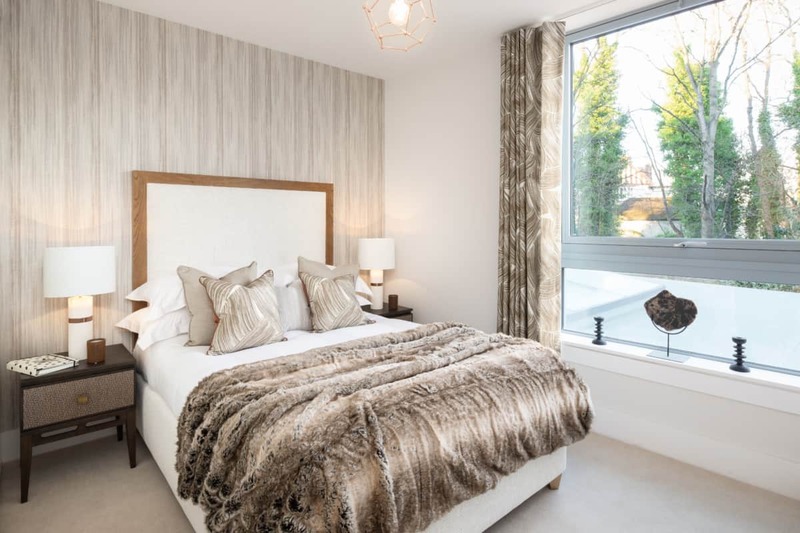 With these luxury new build flats Edinburgh has redeveloped a landmark site with a fabulous central location. These Cala Homes in Edinburgh are located on the 18 acre grounds of Donaldson’s, a hospital for poor and vulnerable children established in 1850 at the bequest of a Victorian benefactor. 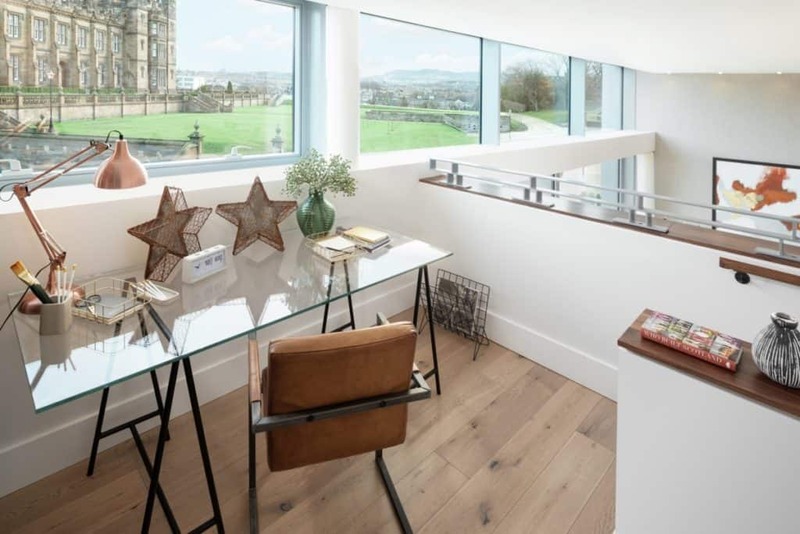 The new build flats overlook an Edinburgh landmark building designed by famed local architect William Playfair. The Donaldson’s Trust has moved its operations to more modern facilities. Cala Homes has turned this landmark building into state of the art homes for today’s urban dweller. 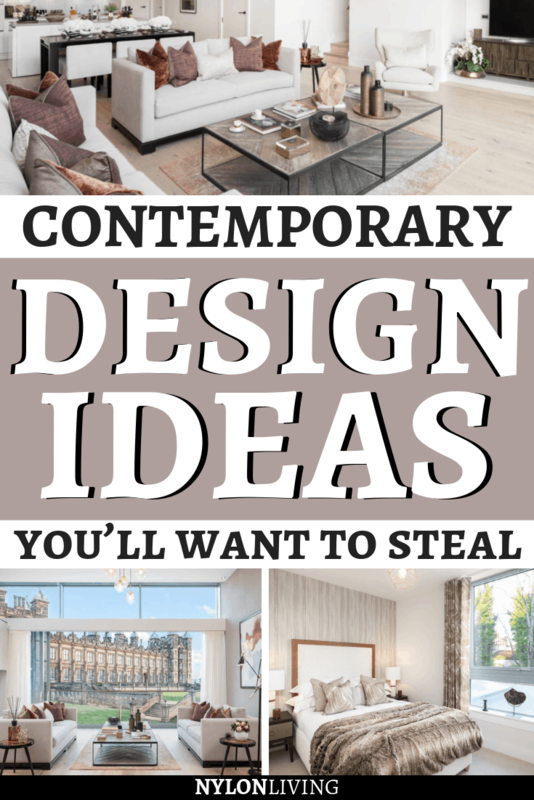 The contemporary interior design was done by Alexander James Interior Design. 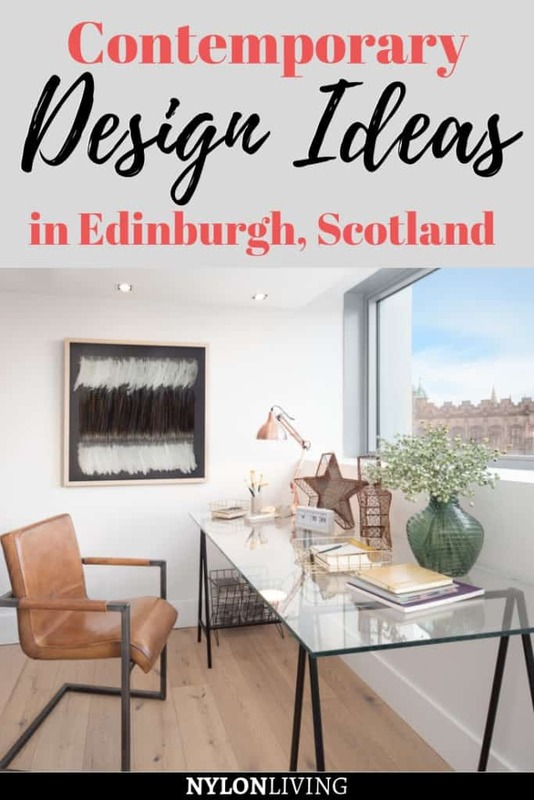 Let’s check it out for a masterclass on how to blend old and new design in these new build flats in Edinburgh. Floor to ceiling windows lets the light flood inside. In the bedroom, frosted glass still provides privacy for when the curtains are drawn. 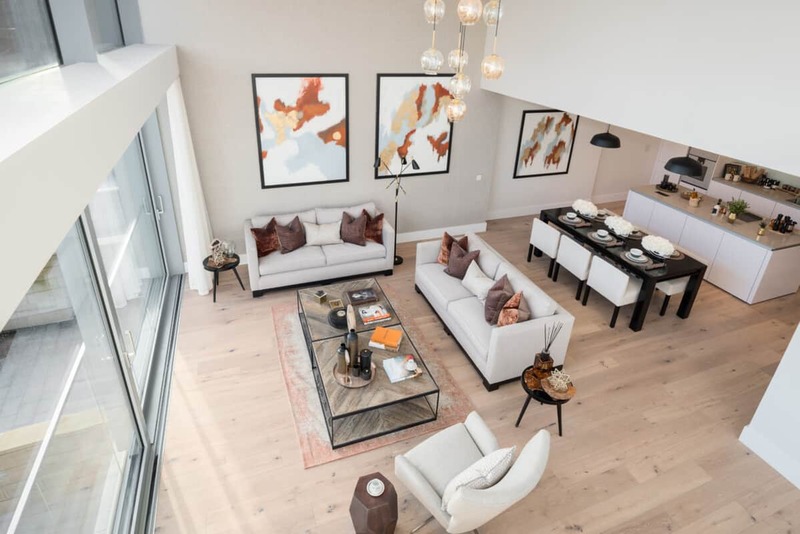 Double height ceilings and floor-to-ceiling windows maximises light flooding into the living room in these new build flats Edinburgh. The floor to ceiling windows are in the bedroom as well. 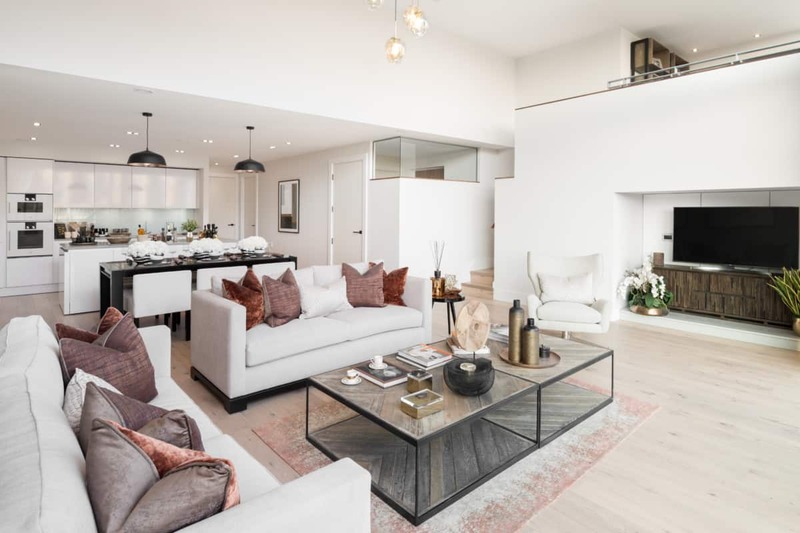 You can see how deep this open plan living space is. The back recess areas of the kitchen really benefit from the double height glass wall allowing light to penetrate deep into the heart of the room. I have always loved an open plan concept but with enough division for everything to have its own space. Here you can see the stairs leading to the mezzanine study and an internal glass wall that allows light into the one of the back rooms. You can cook in the kitchen and still feel a part of whats going on in the dining and living room. Double height ceilings add drama and grandeur. So many developers try to squeeze as much square footage out of a space as they can because they only think of the old formula that square feet adds money. 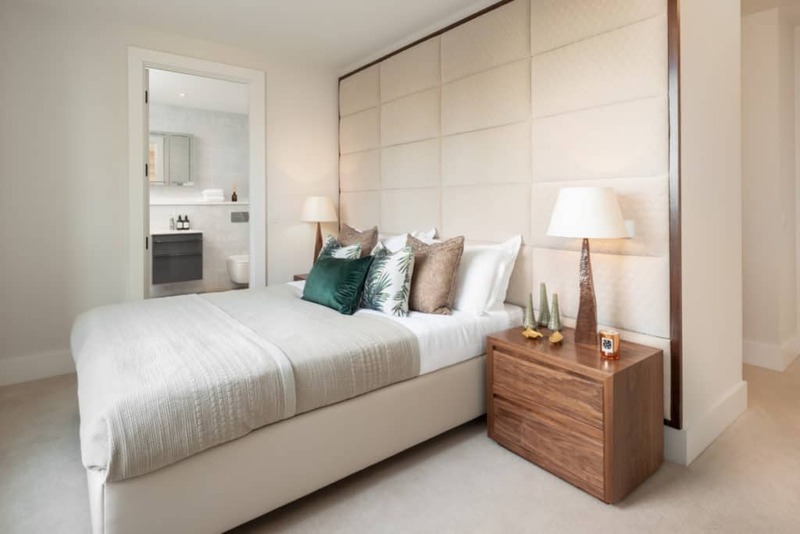 A design this grand though adds a ‘wow factor’ which equally adds to the value without creating shoebox rooms. Double height ceilings also add a sense of grandeur which is keeping with the view of the grand Georgian architecture on view outside. Use the extra height of the ceiling for a functional workspace on a mezzanine level. 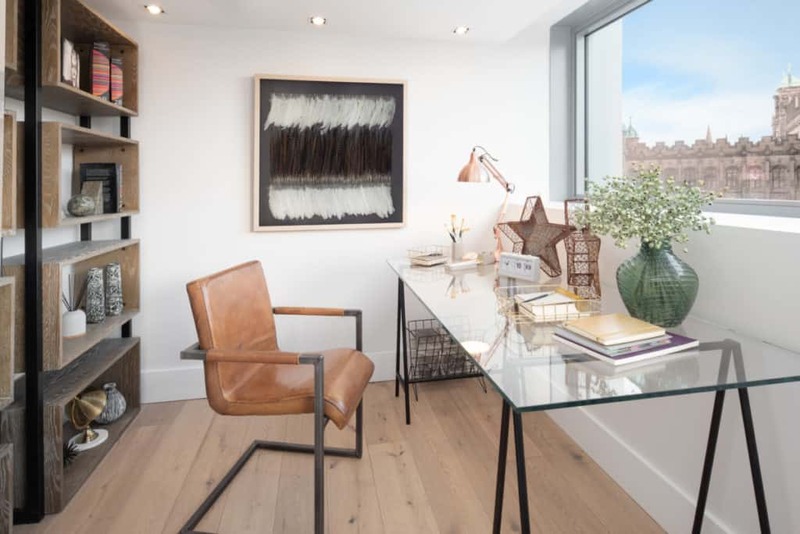 You don’t really need that much space for a home office AND keeping work in one contained area stops the creep of papers/work throughout the home. I also love how the space is flooded with light so that working isn’t such a hardship. Feeling good in your workspace makes you more efficient! I want to spend my time in the home office said no one ever. You don’t actually need that much storage nowadays because the world is going paperless. 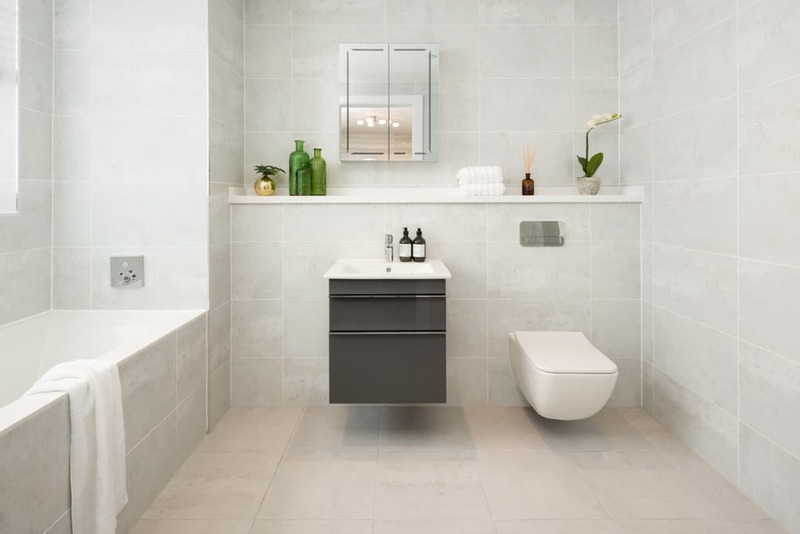 Wall hung bathroom furniture makes the space look larger. Floor to ceiling tiles also help with making the space look larger because the appearance is seamless. 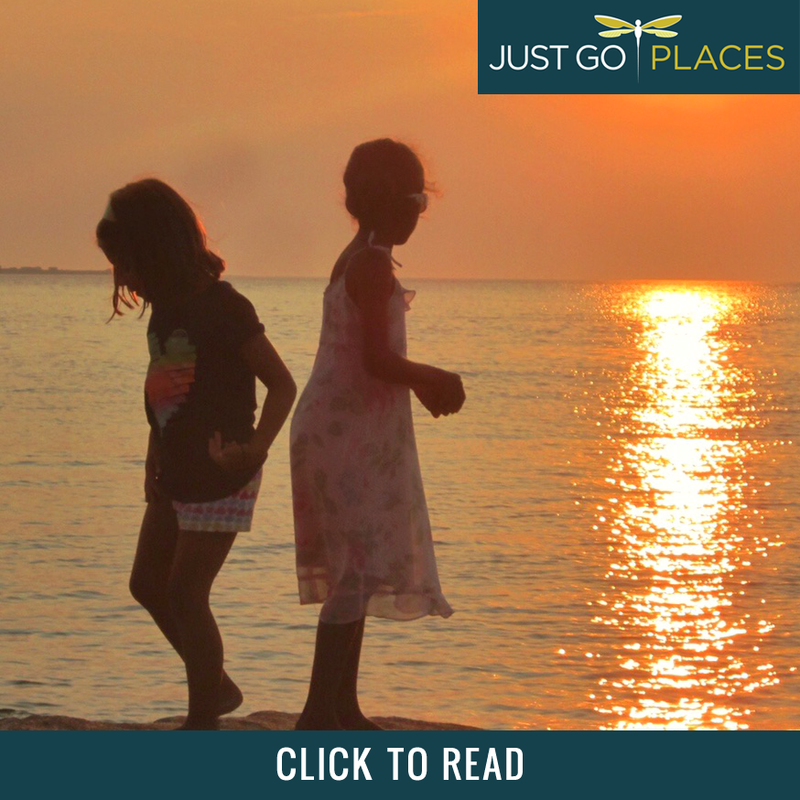 A reading nook is a great idea for when you want downtime but are not ready to sleep yet. 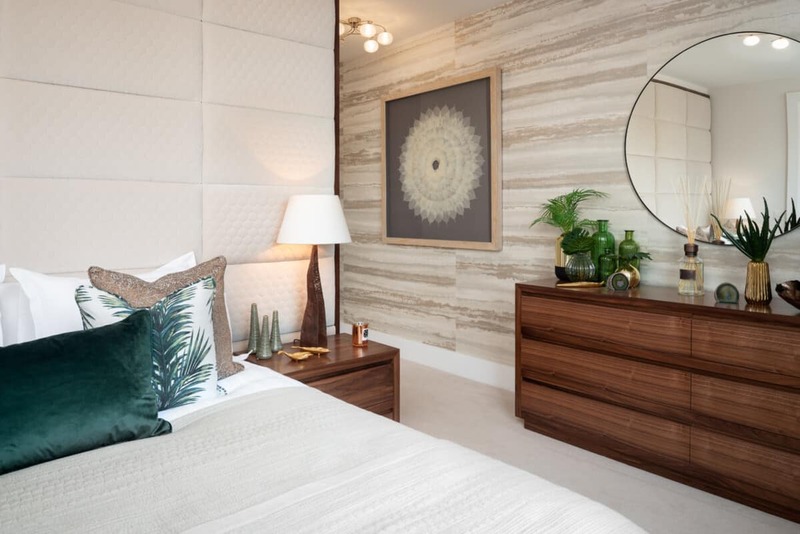 Have you thought of textured walls to create coziness in a bedroom? Colorful throw pillows are an easy way to jazz up a neutral bedroom. Like the look of these new build flats in Edinburgh? Spread the Word! Pin this to your Pinterest Boards for future reference! All images credited to Alexander James Interior Design.